According to recent surveys, the average cost of a wedding exceeds well over $20,000, and event coordinators familiar with current pricing say this figure may be considered as one that is rather conservative. Though many modern day brides and grooms love the idea of a lavish wedding for their once in a lifetime event, they also like the notion of cutting costs and saving where possible. 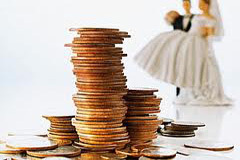 If you’re not wanting to break the bank and looking to save big without comprising the quality of your very special day, the main areas of focus on where to cut costs are the “Big Five” – a term referring to five regions of the wedding planning process that are accountable for nearly 70% of the entire wedding cost. 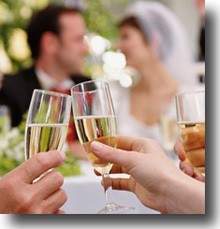 Beyond a doubt, the biggest single expense of your wedding day is the reception. The reception can consume anywhere from a third to over one half of your total budget. Therefore, decisions made in this area will have a large impact on overall cost. The location selected and catered meals are two of the major expenses. A prominent tip on how to reduce costs of both is to prioritize your guest list, placing the guests that must attend your wedding toward the top of the list and others toward the bottom. Then, eliminate from the bottom upward as finances dictate. The engagement ring is the second of the “Big Five” expense items where you can save considerably. There is a wide range of what you can spend on wedding rings, and depending on the weight of importance you place on them, tremendous savings are possible. With various metal types and stones from which to choose, a prudent selection here can conserve thousands of dollars. Beauty is on the inside is an adage that has surpassed the test of time. 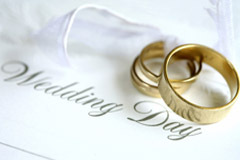 However, your wedding is a once in a lifetime event and you no doubt want to do it in style. There’s nothing wrong with that, but an extravagant, over-priced wedding gown may not necessarily be the best choice if suitable alternatives are available – and many times you’ll find there are. Besides, the most elegant gowns are not always the most flattering. Look for an acceptable option, and a sizeable savings is likely. Indisputably, the photographer can be a huge expense. Depending on the photo package chosen, decisions made here can have you spend or save thousands of dollars. Personally, having a background in photography, I can say assuredly that quality will not necessarily be compromised if you hire a professional photographer without a branded name as opposed to hiring a professional with one, so long as you research his credentials carefully and review his recent work. The end result should be a product of comparable quality with a surplus of savings. Another major expense that’s part of the “Big Five” is the honeymoon. Common sense should guide you with this decision. Much of the outlay for the honeymoon rests upon the travel distance required to get to your chosen destination and how extravagant you want your honeymoon to be once you arrive there. A two hour drive up the coast to a nice lodge situated along the waterfront for a few days versus a week at a five star hotel in a foreign country can skew finances significantly. Determining your priorities carefully by examining the “Big Five” wedding expense items can result in diminished overall wedding day expenditures, allowing you to save considerably on your wedding day or permit you to place emphasis on that which is more important to you. Incontestably, you certainly don’t want to compromise the quality of your special occasion, but if opportunity presents itself, why not save where you can if there are acceptable alternatives. 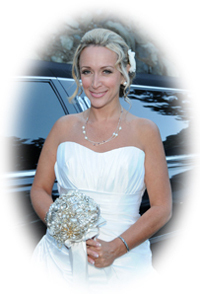 If you’re planning a wedding and would like to obtain additional saving ideas, view the contents of our wedding packages on our website as we provide a great deal of amenities at a very affordable price for all of our Tahoe weddings.